I started this series by stating that the effects of the rollkur is most often misunderstood. 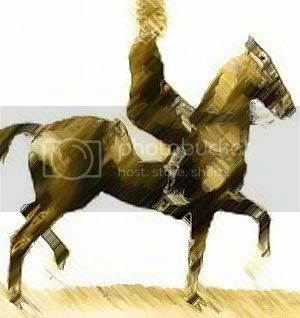 And I also started writing because so many people condemn other riders for riding the horse behind the vertical, when they ride the horse over the bit themselves, which may be as harmful for the horse depencing of course on the circumstances. All in all, what I wish for, is that more riders strive to become better themselves, and stop worrying so much about others. At least we should be ready to inform or help others who ask for help, and not try to press our opinions on others. Just as horses never learn from us punishing them for doing something wrong, humans neither benefit from being harassed over the internet or backstabbed by friends or foes. This attitude pesters the whole riding community, and even prevents us from learning from each other. That is one of the reasons I wish to show you that you may have something to learn from the riders who occationally train their horses behind the vertical. 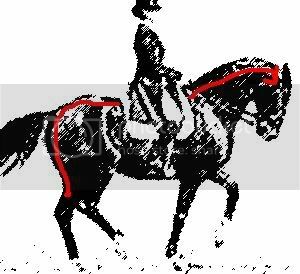 I will also show you the real reason why they have trouble engaging the hindquarters, which is NOT the hyperflexion training, but the same problem many of their adversaries have, namely their stiff hip joints and their lacking ability to let the horse carry from behind for real. I know that many anti-rollkur groups think that they, or at least their leaders or idols are transfering weight to the hind legs. But I am not always so sure of that. For the hind legs may be under the horse, without actually taking up any extra weight. And then it becomes a trick only, an illusionist optical effect, dazzling the onlooker, but giving no benefit to the horse. By saying this, I at the same time say that this is as difficult for Pelle and me as for everyone else. We manage to do it correctly only in good moments when training at the moment. It is very difficult, and one must train the horse's capacity for a long time, mobility, strength, coordination, agility, power, impulsion, balance, etc etc. What I say is: Who are we then to blame others for not doing it? Who is anyone to continue this blaming business? Stop it! I seriously consider those who continue this sorry backstabbing game to be either envious or afraid that someone will come up to them and discover their own shortcomings. But as long as one is so busy blaming others, the other will of course continue trying to attack you. It is a natural reaction of defending themselves. Let us look at some pictures of horses with their necks at the wrong place. Now this is the rollkur kind of picture we usually see. It looks completely exaggerated and without point, and I suspect this is taken at a point where the rider really lost it. 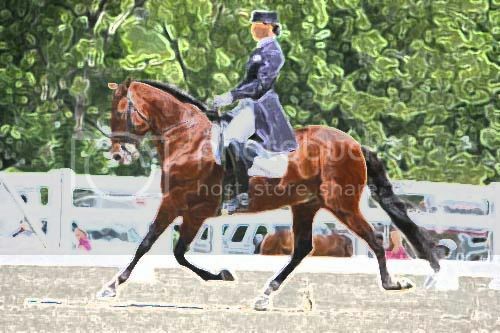 It looks as if the rider originally wished to stretch the withers and neck while the horse was moving in a trot, and it became way too much. 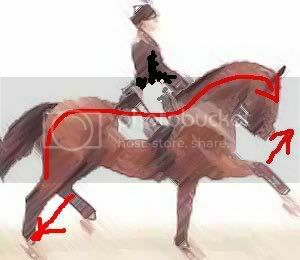 The topline of the horse is not able to stretch this much, and if it was, it would defeat the purpose, for then it would be impossible to use that topline to carry from behind, for it would become too long. 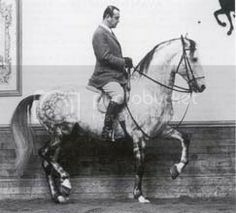 Since the topline has got one length once it has been stretched to its ideal length, one can choose: Either hindlegs under, carrying from behind, or nose under, horse on the forehand. It is that simple. However, you need to stretch a horse that is too stiff, else you are not able to ask him to carry. Here we can see a horse in the piaffe that has been trained like the one above. The hindquarters are not really carrying, and the front leg is under the center of gravity. Now, training behind the vertical with blocked hips and no engagement from behind over time, will distroy the diagonality over the back, and the horse will become able to lift its forehand regardless of the carrying from behind. The horse will learn to use the muscles on the underside of the neck to lift the front legs instead of lifting the withers. The withers are open, and the base of the neck is up, but the hind legs are not able to lift the front. The horse is open behind, and there is no real impulsion, just what we call "running". All the faults that we see above are not because of the hyperflexion training, but they come from the lack of engagement from behind. Head and neck good, but the horse is not over the back, has lost its rythm, and fallen on the forehand. Now, let us have a look at some of the pictures idealized by the rollkur guerilla. "The riders from yesterday were much better riders, riding poll up, nose fore and in such a free form" is often argued by the guerilla. I find no beauty in pictures such as this. This illustration is of course one of the worst I could find, to emphasize my point. But all pictures from the same style of riding show the same faults: No back stability. 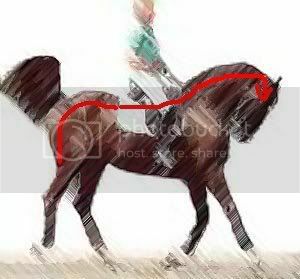 No parallellity between hind and front legs (which means no back stability) Often you may see a ewe neck as well, since the horse is unable to lift its withers in this outline. And now I am going to commit sacrelege to many of the guerilla. This is not carrying from behind. The forehand is lifted, but not from behind. The parallelity is lost, the back is not carrying, and the hind fetlock is not bending more than the front. Now, my point is not to criticize all these riders. My point is: The only way to work on this is to try to solve the issues that I have described. To try to find out how to really help the horse carry from behind. And my point is: The problem is not the hyperflexion, the problem is the lack of carriage from behind. And regrettably, that means I will have to write more about that. But I have promised to write about stretching exercises for the human first. Thank you for being so patient so long. I will be back.